We are the Church Leaders of Aleppo met at the Syrian Orthodox Archdiocese of Aleppo on Friday 24th August 2012, in an extraordinary circumstances, to discuss the current political impasse in Syria and its unprecedented and foretold consequences which are currently unfolding with an ugly magnitude all over Syria and witnessed and suffered by all Syrians and especially Aleppians. We were told by history that Christians in Syria are home grown, endogenous and ancient component of the Syrian demography. Throughout their long co-existence and patriotic struggle to up hold their priorities to live in dignity in a sovereign, independent and free homeland together with all Syrians. They believe that differences in opinion should consolidate and contribute to the enrichment of the culture of plurality of Syria. They advocated freedom of conscience, freedom of religion and democracy and dreamed to live in love with other which underpinned by social justice, peace democracy. They believed that citizenship is the celling under which such milieu thrives, regardless of the faith, religions and affiliation of the co-citizenee. As in the past Christians in the Middle East and their churches’ leaders today, in spite of their reduced circumstances and number, will not spare any effort in endeavouring with all peace loving people in the region and worldwide to get Syria out of this vicious circle of violence, and anarchy that undermined the national fabric and eroded its unity and to re-establish truces, law and order, security and advocating for reform, inclusiveness, social justice and peace . They are currently working to highlight the inhuman conditions and plight endured of their fellow Syrian citizens as a result of this relentless violence, urging humanitarian and benevolent organizations in neighbouring countries and further afield to step in to relief the suffering of the Syrian people. Reminding the world of the Humane and hospitable approach that the Syrian people showed to embrace and elevated the suffering of Iraqi refugees when they reluctantly found themselves in Syria escaping the waves of violence since 2003. Now the Syrian people witnessing the same dilemma and in need in the absent of a proportionate humanitarian aids. 1 – We welcome the visit of His Holiness Pope Benedict XVI to Lebanon in September 2012. 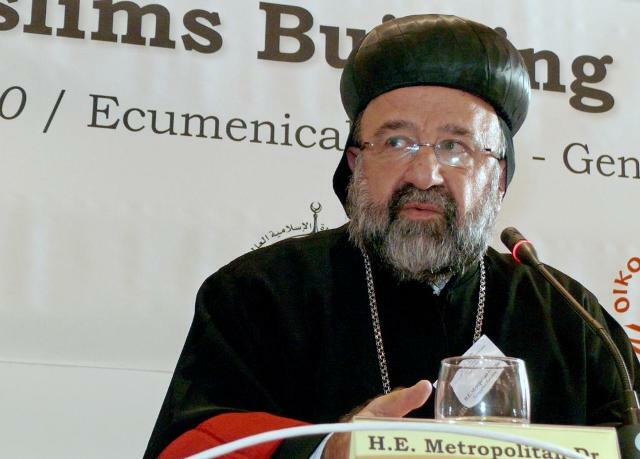 To present the Post-Synodal Apostolic Exhortation of the Special Assembly for the Middle East of the Synod of Bishops. Communion and Witness, which was convened at the Vatican in October 2010. 2 – We refuse all kind of immigration as a response to the recent crisis in the Middle East and strongly condemn all propagators, instigators and provocateur s who calls to Middle Eastern Christian to migrate. 3 – We refute and refuse all kinds of religious extremism and radicalism and the evolved language of intimidation and threat that is directed toward the demographic components of our homeland regardless of their religion, creeds and affiliations. We also repudiate the arming of churches under any pretence. 4 – We consider all prisoners of current conflict are prisoners of conscience in the safe custody of their captives. Enjoy the full respect of their dignity, in accordance to the values and moral ethics teaching of our religions. We also repudiate and condemn all acts of violence and kidnaping under any pretence. 5 – We call on all people with free conscience to refrain from all type of violence against fellow human being. We also call to meaningful reform and to stand by and enable law-and order, justice and peace. 6 – We reiterate our convection and believe that only path to achieve justice, peace and the rebuilding of our homeland is through the love, co-operation and accepting the other. This can only be achieved by constructive and meaningful dialogue between all belligerents’ elements of our country. 7 – We urge all peace lovers and humanitarian organisations to seriously endeavours to provide all possible means of humanitarian and medical relives to those innocent Syrians who were caught in the vicious spiral of violence, badly affected, displaced by the current conflict and underwent internal and external relocation and emigrations. They are currently suffering an unprecedented harsh summer temperature and expected to endure a severe winter conditions. May Lord of Peace give his peace to you in every condition and in everywhere. Signed in Aleppo on 25th August 2012. Jag har läst texten många gånger,men tyver jag har ej kunnat få en klart och tydligt om det han vill säga! eller om han säger något overhuvudtaget.